“Ultrealith” is an electro-acoustic sound-adventure exploring sounds that exist on the periphery of human perception, such as underwater recordings (such as fish-songs, crustaceans etc), ultrasounds (sonar of bats and dolphins, insects), electromagnetic signals and other textures. These recordings were sourced in the Amazonian rainforest, Africa, Canadian Newfoundland, northern Australia and in various parts of Europe. trk1. Meadow [for Paul Coenjaarts] 13:42 | site-based sound-installation composed for „Klanken Verbeeld Beelden Verklankt“ festival in Eijsden, Limburg, Holland (Intro/In Situ) in Sept. 2000. An extract from this piece was published on “Observatori 2000” CD-compilation by Subterfuge Records, Spain. trk2. Expirations 10:54 | based on sounds of insects (1994, northeastern Czechie) & various frogs (Rana ridibunda – May 1993, Wormer, Holland; Bombina bombina – June 1994, Dobruska, Czechie; Alytes obstetricans – Aug.1995 Belgium). Composed Oct.1998, Belgium. Released on “Selflow Comp. [EarOuvres]” by Ooze Bap, Spain (2002). Subaquantum Ultrealith 44:25 | 4-channel composition exploring sounds that exist on the periphery of human perception, such as ultrasonic sounds of bats, underwater songs of fish, insects and other creatures. Experimenting with different ways of creating a multidimensional experience; emphasis on synaesthesia. Composed in Oct 2009.
trk3. 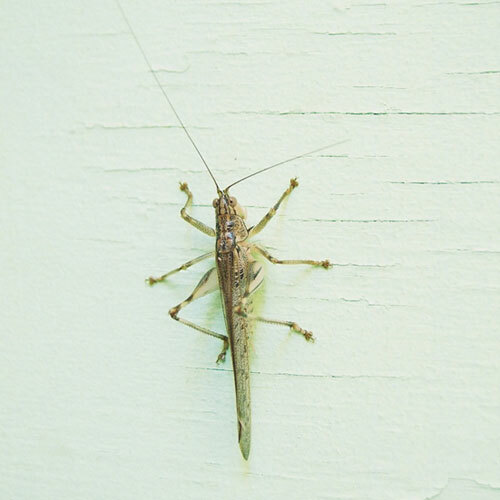 Insectin 11:31 | Created mainly from sounds of cicadas, leaf-hoppers and other insects rec. 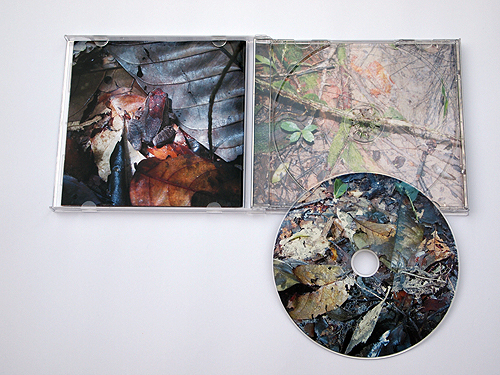 in Mamori, Amazonas, Brazil (2008) [Thanks to Francisco Lopez for kind support] and sounds of reef and mysterious nocturnal birds rec. in Zanzibar, Tanzania, Africa (2001). Basic underlying structure was generated from 30 sec sound-sample provided by Linda O’Keeffe as part of a paralel collaboration project. trk4. Micro & Macro Bats 10:10 | Based on sounds of bats: transposed ultrasonic hunting and social calls of microbats rec. in Ireland (West Cork, Meath, Leitrim – 2008), Australia (2009), Brazilian Amazon (2007-2009); calls of macrobats rec. 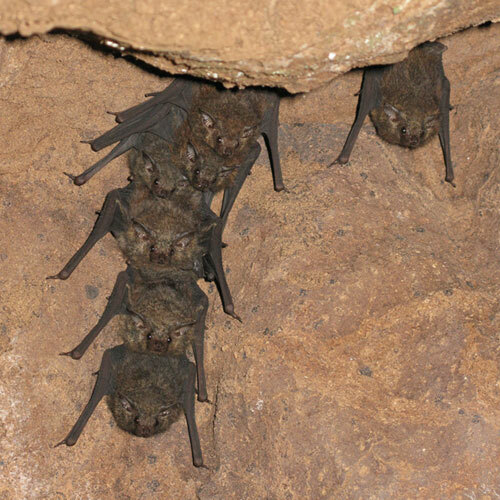 in Kitumu caves in western Kenya, Africa (2000) and flying foxes from Northern Territory, Australia (2006). This section includes electromagnetic audio-imprints rec. in the airplane and car (2009). trk6. Podvodou 12:53 | based mainly on underwater recordings such as various soniferous fish, subaquatic insects and waters of Amazon in Xixuau Xiparina & Mamori, Brazil; crustaceans from seas of Newfoundland in Canada and coral reef from northern Australia; Amazon river-dolphins Inia geoffrensis and sea-dolphins Delphinus delphis from Cape Clear in Ireland. Includes various transpositions of ultrasonic sonar and other sounds. Original underwater recordings were collected between 2007-2009.
trk7. Monochrome  7:47 | 60 tracks of improvised songs of ”2EZ” (rec. in psychiatric unit in St. Brendans Hospital [Dublin, Ireland] during sound workshops 2008-2009; used with permission of the client) and chorus of Leaf-Toads (Xixuau Xiparina, Amazonas 2008). Includes human din rec. in coffee-shop in Singapore (2006); inside metro in Perth, Australia (2009) and other sounds. trk 8. PetRadio 8:55 | 2003, radio-piece for Aether Festival in Albuquerque, USA; based on rec. of domestic pets (as canaries, parrots, cats), radio crackling interferences and other sounds [for Steve Peters]. 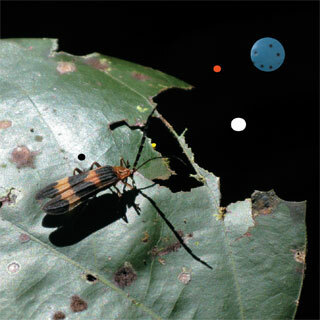 „Ultrealith“ is a very lengthy album of field recordings, featuring pleasing color-coded artwork featuring an orange and black winged insect contrasting with a peculiar arrangement of sewing buttons in primary colors. Artificial Memory Trace apparently have a vast back catalogue of releases, dating back to 1994, but I have never heard, nor heard of any of their recordings prior to now. Over the years, their productivity has, if anything, increased: this album is one of at least 8 releases they have put out in 2012. The first track „Meadow“ is perhaps the most involving piece here, centering around a rhythmically rotating tone, glimmering and glinting in waves of magnetic interference, most likely sourced from sonar. Behind this tone there are distant rumbles of water, and after a few minutes, birds, many birds, and with them they bring the energy of an unthreatening daytime environment, though the same eerie magnetic tone persists. There are some gestural elements, in which a sudden click or similarly sharp and succint sound will herald the entrance of recordings of a new location, or briefly introduce a morphed and slurred voice for a half a second before disappearing once more. This sort use of aggressive use of digital processing lends a menacing intentionality to the structure of the otherwise benign environments recorded. The pacing of the album is very slow, with many minutes of virtually uneventful near-silence. Removed from easy association with their original meanings in the world, the sounds in the recordings start to take on an otherworldly quality. This sort of thing is not for the impatient, but there are certainly some interesting sounds that pop up here and there, such as the crisp, metallic buzz of live power lines, the somehow granulated lapping of water, and a myriad chittering of bugs in the second track „Expirations – Subaquantum Ultrealith“. This 10 minute track ends with the laughing, over-zealous asymmetrical rattles of unfamiliar tropical toads. The third track „Insectin“, another 10 minute opus, continues the theme of tropical, life rich sound environments. Flute-like bird calls and a magickal blanket of frogs croaking are joined by some generative sample splicing, gradually shuffling rustling contact sounds into an assembled rhythm out of stuttering repetitious subdivisions. The howl of the wind becomes louder, and the digital glitch effects multiply in density, only to drop away into an eerie calm, which is occasionally interrupted by strange grunts of distortion and slimy, babbling liquid sounds which evoke the image of a slope eroding and beginning to avalanche. „Macro & Micro Bats“ is another amazing understated epic, which focuses around some bubbling and crumbling synthetic distortion which almost sounds animal at first, then skitters and jumps in clearly unnatural rhythm. Some eerie muffled synth tones periodically and sluggishly blink soft colors. Up until this point the album has been a remarkably immersive journey, without any wasted space and a deeply mysterious, subtlely sinister feeling about it. The only misstep to me is the inclusion of the „Monochrome“ tracks, which are largely comprised of speaking voices uttering various poetic phrases. The layering is so dense that few words are discernable, and in the case of „Monochrome 1“, the voices speak without affect, and the texture of the track is ultimately bland. Luckily, this one is short. The 2nd in the series is much longer, and attempts to incorporate a mournful improvisatory acoustic guitar and some lamenting, drunken singing, but the mix once again becomes so dense a din of voices as to let no structure or texture emerge. At 7:48, this becomes very tedious, and makes the album much harder to listen to for me. The field recording side of the band’s music is much more interesting. This album is very difficult to listen to all at once, yet simultaneously is full of profundity. Though Artificial Memory Trace cares nothing for being concise and there a couple of dud tracks with „Monochrome“ 1 + 2, it would be a shame for any fan of field recordings to miss out on the detailed insectoid worlds captured and meticulously arranged on „Ultrealith“. Die Zikade, Teil 7, Kapitel 1: Merke! Wo Gruenrekorder drauf steht, sind field recordings drin. Kapitel 2: Hinter dem Namen Artificial Memory Trace verbirgt sich der nach Irland ausgewanderte Tscheche Slavek Kwi. Kwi begann als visual artist, interessierte sich aber mehr und mehr die Elektroakustik und natürliche Sounds. Kapitel 3: »Ultrealith« vereint beide Prinzipien. Naturgeräusche, aufgenommen am Amazonas, in Australien, in Kanada etc., wurden teilweise pur verwendet, teilweise mit naturfremden Soundsamples gemischt (man sagt »assembled« dazu), und natürlich entsprechend arrangiert (man sagt »komponieren« dazu). Kapitel 4: Der fast unaussprechliche Titel der CD sagt somit alles, die Naturgeräusche auf »Ultrealith« sind so ultra real, dass sie im Grunde das genaue Gegenteil davon sind. Kapitel 5: Kwi ist ein Fan von John Cage, ein Stück ist dem Meister direkt gewidmet. Tatsächlich erinnern die kargen, zurückgenommenen Elektronatursoundcollage mitunter an die späten, stoischen Cage-Stücke. Kapitel 6: Das Booklet zeigt Zikaden, Frösche, Fledermäuse und ein Mikrofonkabel, das direkt in ein Termitennest führt. Kapitel 7: Wo Gruenrekorder drauf steht, sind field recordings drin. Merke! Un plaidoyer en faveur de la musique tchèque ? Faut dire : Slavek Kwi nous y invite en expédiant d’un coup d’un seul deux récents enregistrements de son Artificial Memory Trace. Une trentaine d’années qu’il travaille à ses enregistrements sur sites – le temps donc de collaborer avec un autre grand nom du genre, Eric La Casa –, c’est dire si ses efforts méritent d’être récompensés… par quatre clefs, un diapason d’or ou dix perches tendues et qui forment une étoile ! Porté par un intérêt pour le dauphin d’eau douce (ainsi ai-je appris l’existence des dauphins d’eau douce), voilà Kwi parti pour le Brésil pour en revenir avec Boto [Encantado]. Avec les chants qu’il a recueillis des bêtes, il construit une histoire. Me voici invité à entrer dans un paisible zoo où les animaux crient barrissent roucoulent puis dirigé dans une grotte sombre. La grotte est longue et regorge de présences et, qui s’y frotte s’y pique, le moindre effleurement est une menace. La voix du dauphin a été modifiée et n’est qu’un des éléments d’une dark ambient qui n’est pas piquée des vers (ou des hannetons, au choix). Oui, ce genre d’hannetons qu’on aurait pu croiser sur la pochette d’Ultrealith, où Artificial Memory Trace joue avec des enregistrements de bruits du monde entier, normalement difficiles à capter. Tous dans la même boîte, ils participent d’une musique électroacoustique où l’aquatique a aussi son « mot à dire ». Pour avoir nourri ces sons à une heure indus, Kwi ne peut que constater leur métamorphose : du monde muet il a fait un fort en gueule à maxi-tête (de chauve-souris, d’insectes, etc.). C’est effrayant mais nous savons tous que ce genre de monstre n’existe pas. Ô qu’il est d’autant plus beau à entendre ! Slavek Kwi is a sound artist, composer and researcher whose main focus is on the phenomenon of perception as a determinant of the relationship with reality. 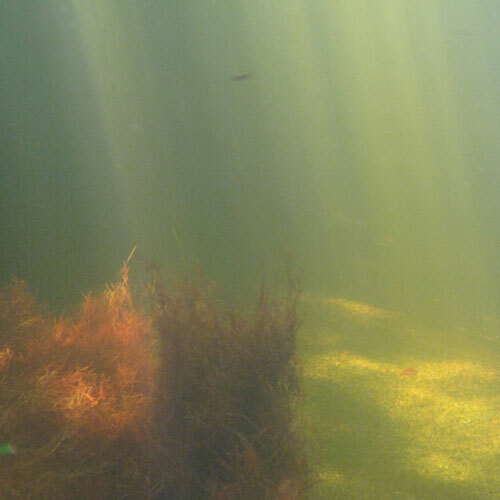 „Ultrealith“ explores the sounds that exist on the periphery of human perception, such as underwater recordings (eg, fish songs, crustaceans, etc. ), ultrasound (sonar of bats, dolphins and insects), electromagnetic signals among others. These recordings are from the Amazonian rainforest, Africa, Canadian Newfoundland, northern Australia and in various parts of Europe. On several tracks are relate with field recordings of animals, fish and insects, on which Kwi intervenes sounds with some digital processing, except on ‚Monochrome 1‘, where it is perceived the voice of the Father of minimalism John Cage’s, while on ‚Monochrome 2‘, it’s a juztaposición of voices and guitars which are recorded in a psychiatric unit in Dublin. […] Cage also appears in Ultrealith. This being the name Slavek Kwi gives to his collection of ’electroacoustic sound paintings’ as recorded under his Artificial Memory Trace moniker. Cage appears on track five, a two minute piece entitled ‘Monochrome ’ in which multi tracked loops of Cage’s voice produce a dizzying babble of voices with just the odd snippet of clarity revealing a certain phrase or a single word. Cage would no doubt have approved highly in the way Kwi mixes the sounds of insects as found in several different countries to make one unique sound. Or the way, in the space of one track, he takes a recording of an inmate of a lunatic asylum strumming an acoustic guitar and singing, a game of table tennis, the Perth Metro, a coffee shop in Singapore and some leaf toads in the Amazon. It may look like a bit of an had hoc chucked together misshapen mess on paper but the results are stunning, its like Reynols got it together with Francisco Lopez. There’s plenty to admire here. I am in awe. In the hypnotic 13 minute opener ‘Meadow [for Paul Coenjaarts]’ you’ll hear a pleasantly burbling stream, a straight to the center of the brain bowl ring, bird chatter, random ticking, a female voice that says ‘what do you think?’ and a low hertz industrial throb that appears and then slowly disappears. 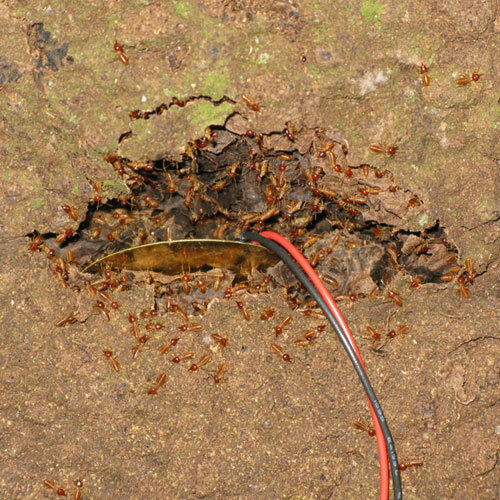 ‘Insectin’ contains the sounds of insects recorded in the Amazon, nocturnal birds from Zanzibar beneath which lies some fine electroacoustic crackle. These are sounds that caress the ear, some recorded underwater, some existing on the very edge of human hearing. My only regret [and I think I’ve voiced this before with Gruenrekorder releases] is that I don’t have the reproduction equipment to match the quality of these recordings. These are some of the most vibrant, exotic and delightful sounds I’ve come across in many a year. I sincerely hope that one day I come across one of Kwi’s installations. I shall walk and listen in open wonder at his fine achievements. «Ultrealith» – сборник композиций, подготовленные для различных инсталляций, а также сольные работы «Artificial Memory Trace», созданные практически на «подножном» материале, который каждый из нас может найти, увидеть и услышать в любой момент, но вот почему-то масса этих звуков так и остается незамеченной, пока внимание на них не обратят такие исследователи, как Славек Кви. В отличие от многих коллег по цеху, для которых полевые записи ценны в чистом виде и позволяют привлечь внимание к различным аспектам бытия и сопутствующим им проблемам, для Кви голоса экзотических животных, насекомых, птиц, звуки природы и бытовой шум – «всего лишь» строительный материал, из которого в итоге получаются настоящие музыкальные (как бы странно эта музыка не звучала) произведения со своей драматургией (какой бы странной она не была), присутствующей в каждом из представленных треков. Хорошие наушники и упаси боже от MP3 – вот хорошие наставления для тех, кто готов погрузиться в мир «Artificial Memory Trace». На «Ultrealith» он представлен во всей красе, и здесь можно посетить весьма необычные его закоулки, неизведанные даже преданными поклонниками. Большинство саундскейпов создано на основе записей, сделанных в самых экзотических уголках планеты: в Танзании, на Занзибаре, в Кении, в Бразилии, на берегах Амазонки. Не забыты и более близкие страны, вроде Ирландии и Голландии. На этих территориях Славек открывает уникальные экосистемы, микрокосмос, большинство обитателей которого легко уместятся на вашей ладони (если вы не боитесь насекомых). Треск, шорох, писк, шуршание жуков, кваканье лягушек, стрекот сверчков согласуются с пением ночных птиц, фоновым шумом, подводными записями, с которым охотно помогают дельфины, вместе с летучими мышами создающие симфонию ультразвука, куда свою лепту вносят…электромагнитное излучение, радио помехи, обрывки фраз, гул ветра в пустых мусорных баках на типичной городской окраине и дребезжание проезжающих машин. Элементы композиций могут находиться на самом недоступном уровне или располагаться на расстоянии вытянутой руки, могут быть на воде и под водой, могут образовывать эмбиентные монотонные петли, тающие во влажном тумане джунглей, или же появляться всего на один, но очень драматический миг. Одним словом, здесь возможно все – и этим музыка «Artificial Memory Trace» интересна и ценна. Ну и о «странностях» – Славек не забыл и о человеческом голосе. Раз уж мы – часть природы, то пусть наша речь вливается в пространство окружающего мира. И она вливается – в первой части «Monochrome» 64 кусочка разных фраз становятся похожими на назойливое жужжание стаи мух, а вторая часть отправляет на экскурсию в сумасшедший дом, наглядно демонстрируя последствия ситуации «одна гитара и целая палата психов, каждый из которых пребывает в своей реальности». Надо заметить, эти две вещи плохо идут на подержание нашей репутации «главного существа на планете», дельфины и жучки могут быть гораздо более гармоничными и упорядоченными существами. Quite recently, I was having a conversation with a musician of some renown. We were discussing field recordings, the plethora thereof, many of which find there way to my abode. „If I were running things“, he said, „there would be certain sounds you’d simply not be allowed to use: water, birds, traffic sounds, church bells, airplane engines, wind. I’d make it really, really hard to be able to construct a good recording from the field.“ I couldn’t help but take his point. So many come down the pike, so many, after digesting, are all but indistinguishable. Pleasant but innocuous. I’d add something else: that they’re subtly coercive in the sense of taking an environment, one that, were you actually there, you’d have your choice of areas of concentration, etc., and insisting on a certain focus. This happens all the time in „music“, of course, but something about it sits wrongly with me. Exceptions abound, to be sure, especially when the field has become subtly and beautifully transfigured (Pisaro’s „Transparent City“ set comes quickly to mind) but all too often I end up feeling like someone who’s just browsed a friend’s nicely put together and shot photo album. It’s fine, but…. „Ultrealith“ falls into that slot of modified field recordings, eight tracks assembled over much of the past couple of decades. Fairly quiet, many insectile and avian sounds, often streaked through by gentle electronics of one kind or another, sometimes soft percussive flurries, occasionally taped voices, but nothing particularly gripping or, as it were, memorable. Some of the works were conceived as installations and, as with many a release in this area, one can at least imagine a more conducive experience being had if one were permitted to walk through the sounds, divert one’s attention as desired, etc. As is, it’s pleasant, tickling your soles a bit, but not so much more. Let’s deconstruct a rainforest and rebuild it as a sound object. Let’s walk into it, experience it and find a point where fragments of the modern world bleed in. A bell-like tone repeats and tethers ‘Meadow’, the first track of Slavek Kwi’s ‘Ultrealith’ CD, firmly to the substrata of field-recording based composition. Gentle flutters or sudden bursts of unidentified noise invade the space, but natural sounds also drift in and remain in the background in various configurations, often before vanishing back forever into the ether. Disarmingly, a woman suddenly asks ‘what do you think?’ seemingly from part of a phantom broadcast that disappears as soon as it is detected. As always with Kwi the feeling that pervades his compositions is a sense of awe at the diversity of nature. Images of rainforest creatures, insects, bats and frogs decorate the book of photographs that comes with ‘Ultrealith’, and even in the tracks that don’t explicitly harness the rainforest as a source, we still get the feeling that teeming life is all around us. 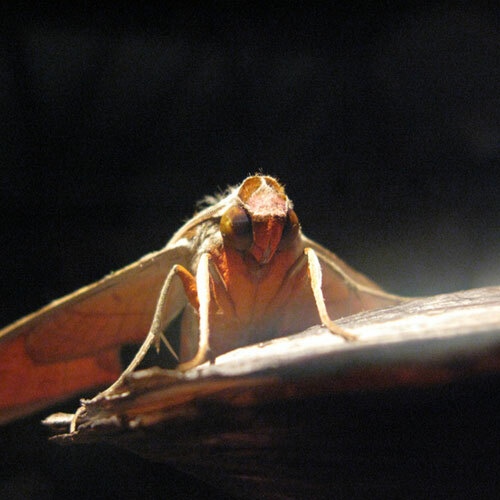 ‘Expirations’ is based on the sounds of insects, and they fly around our ears like airborne motors. The correlation between these creatures and tiny machines is an easy one to make with their hard, evenly contoured exoskeletons, jointed legs and otherworldly eyes. The rapidity of their wing movements and their stridulations are a common motif in this piece, but a host of other sounds are woven into the picture. Birds, water, bangs, cracks, fizzes, whizzes and pops. Bullets! Smashed glass! 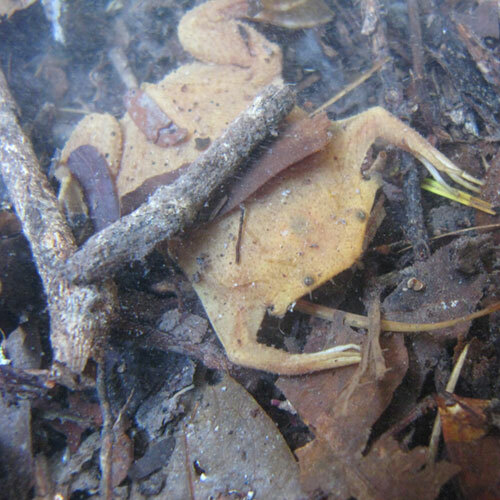 It joyfully ends with a small frog’s single croak. The next 44 minutes belong to a totality called ‘Subaquantum Ultrealith’. It is broken down into five very different tracks, and as far as I can see, the only glue binding them together is the fact that they were all part of a 4 channel performance project made in 2009. Three of the tracks once again draw from Kwi’s nature recordings, and his control of the medium is astonishing. They are threaded through with well positioned incongruity though, just in case we lapse into thinking that these are soundscapes existing out there in reality. Oddly, during ‘Insectin’ a voice asks ‘and how does that make you feel?’ a few times in gradually diminishing repetition. How does it make you feel? Well it makes you feel like listening to it again to make sure you heard it right the first time. The two remaining tracks that form ‘Subaquantum Ultrealith’ are conspicuously different in their formal design. ‘Monochrome 1’ is dedicated to John Cage and consists of 64 recordings of the same voice piled upon each other. It is like listening to sensory overload made audible and is reminiscent of Kraftwerk’s ‘The News’ from ‘Radio Activity’. If listened to carefully, as when in a room of chattering people, directing attention to a single voice can yield meaning. ‘Monochrome 2’ is another construct of predominantly human activity. 60 tracks of a man improvising on a guitar coalesce one by one until he is in his own orchestra of clones. A table tennis game is taking place early on. Recordings of crowded places, perhaps a cafe or a tube station. Then frogs. Frogs. Then nothing. Finally ‘Pet Radio’ is a section utilising the sounds of domestic pets, which in a way also celebrates the act of bringing the wildness of nature into our homes. Cats, for instance, are still hunters and killers, however much they curl up in front of the fire purring and mewing. Eerily domestic birds such as canaries and parrots are heard surrounded by silence, implicitly suggesting their removal from their environment. Sleeping cats sound forbidding and machine like, not too many degrees of separation from the growl of a lion. When playing ‘Ultrealith’ at home our two cats came in during the bird squawks, pricked up their ears and stared at the speakers. Clearly the residual memory built into their DNA of stealthy predation is not so far beneath the surface. Beautiful in its construction and realisation, yet not afraid to bowl the odd googly, as we say in England, ‘Ultrealith’ is a work of intricate composition that no one but Slavek Kwi could conceivably have produced.